As we approach Halloween, I’m reminded of last year’s Zombieland, a brilliant horror-comedy staring Woody Harrelson, Jesse Eisenberg, Emma Stone, and Abigail Breslin. In the movie, Columbus (Eisenberg) refers to thirty-three rules for surviving the zombie apocalypse. The following four rules were mentioned by writers Paul Wernick and Rhett Reese in interviews but they don’t have numbers associated with them. 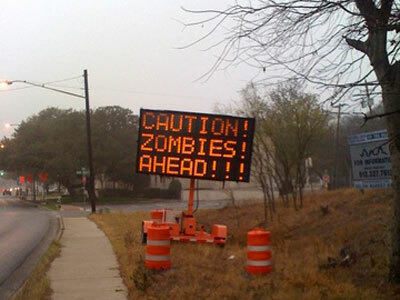 And never forget, there may be Zombies Ahead!